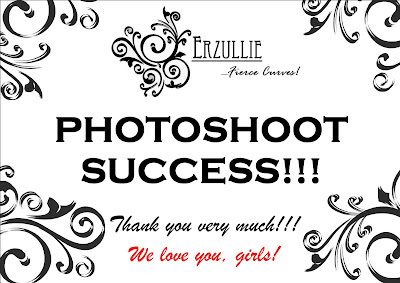 Erzullie Fierce Plus Size Fashion Philippines: SO HOT IN THE HOLIDAYS! YULE 2011 PHOTO TEASER! SO HOT IN THE HOLIDAYS! YULE 2011 PHOTO TEASER! It was supposed to be posted yesterday but due to the very busy weekend of Erzullie, there was not just enough time. @_@ Apologies! Anyway, here is the photo teaser for the YULE 2011. Congratulations to our new icons! Khriselda Guarin, Karen Mangahas and Jhaki David! We would also like to welcome back our EI Resort 2011 Icon, Marian Beltran! We would like to thank: Michelle Luciano for the photography, Louis Lara for the help with the Make Up, Rouge Studio for the place and Camera Capo for the group photos. More behind the scenes coming up soon! More updates? Visit our other social sites!